What if a major fracking-related earthquake took out the major oil storage facility in Cushing? It would only make sense that the nation’s hydraulic fracturing, or fracking, boom would eventually cave in on itself because it has been based on environmentally unsound practices. The product itself is never completely safe because the process and philosophy in producing it is a human error of immense proportions. The New York Times published an article this week citing a scientific study that discussed the potential for earthquake damage at the “Cushing Hub,” one of the largest oil storage facilities in the world. Cushing is located in central Oklahoma between Oklahoma City and Tulsa. The oil storage facility there is linked to oil pipelines that feed into it from locations across the country. Of course, if the oil storage facility gets heavily damaged by earthquakes and massive amounts of oil are lost then that would only spur more fracking—and more Oklahoma quakes—to make up the difference. Gasoline prices would spike. Oil company stock prices would soar. It would be a boon to the oil industry. The mass extraction of fossil fuels creates its own flawed and immoral internal logic because it’s unnatural. The concern about the Cushing Hub is very real. Continuing large earthquakes in the Cushing region—a 4.5-magnitude quake rumbled close to the facility last weekend—may well damage the oil storage tanks and pipelines that feed into them. 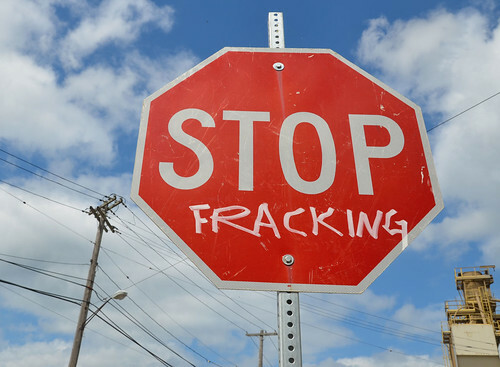 In the fracking process, water laced with toxic chemicals is injected by high pressure underground to create fissures in rock formations that release fossil fuels. The wastewater is then injected underground into what are called disposal or injection wells. Scientists have concluded the injection well process is triggering earthquakes in previously dormant fault lines in Oklahoma. Our state is on track to experience more than 900 earthquakes of 3.0-magnitude or above this year. Just a few years ago, the state experienced around two to three small earthquakes annually. The earthquakes are rattling nerves here as people wonder about damage to their property and worry about their own personal safety. The Cushing oil hub stores oil piped from across North America until it is dispatched to refineries. As of last week, it held 53 million barrels of crude, said Afolabi Ogunnaike, an industry analyst at Wood Mackenzie, a natural resources analytics firm. The earth beneath the tanks was comparatively stable until last October, when magnitude 4 and 4.3 earthquakes struck nearby in quick succession, revealing long-dormant faults beneath the complex. Three more quakes with magnitudes 4 and over have occurred within a few miles of the tanks in the past month. Both Gov. Mary Fallin and Attorney General Scott Pruitt, who have received significant campaign contributions from the oil and gas industry, are not doing enough to address the earthquake crisis here and will never do so. The Oklahoma Corporation Commission, which regulates the industry, has been slow to react as well but its ability to take action is legally limited anyway. It’s the horror storm of perfection this Halloween season. Fracking is so environmentally wrong it eventually collapses in on itself. Who among us doesn’t get it at this point? The environmental damage if the Cushing Hub is severely damaged would be enormous, and it would affect everyone in central Oklahoma. The federal government needs to get more involved in our earthquake emergency at this point. The oil and gas industry here has way too much local political leverage, and our state Republican-dominated government here has been hapless and slow to react because of it. Potential damage to the Cushing Hub, which now stores more than 50 million barrels of oil, is a huge security issue for our entire country and should be a major concern for Oklahoma state leaders.